The racking that holds the panels is an integral part of any solar electric installation. Without it, nothing would keep the panels in place and keep them stable in high winds or other adverse conditions. High quality racking is a safety must, and there are different kinds for different situations. 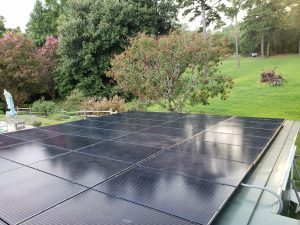 Some roofs don’t lend themselves well to conventional long lengths of rail to mount solar modules to the roof, and so here are two examples of residential solar installations where we’ve used SnapNRack products to successfully complete projects. Sometimes, a large shed, cottage, or outbuilding gets better solar exposure than the main building on a customer’s property. But roofs of these structures aren’t always easy to work with, often with metal roofs rather than asphalt. Needing a different approach, our team incorporated SnapNRack with great results that satisfied the customer. From rural areas to the city, there are applications for SnapNRack in urban areas as well. Our team was looking for a flexible solution for this row house roof and the product worked great here, letting our designers and installers prepare and build a layout to take full advantage of the flat roof space available. 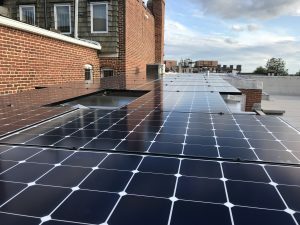 With options to adapt to most any roof type, provided the roof is young enough and in good enough shape, we’re lucky to have partnerships with manufacturers and distributors of products to help make your most optimal, powerful, and beneficial solar energy installation for your home, business, or non profit.